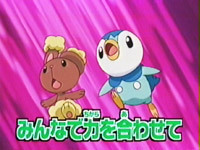 Japanese Episode DP 017: "The Great March of the Ancient Pokemon!" American Episode 481: "Wild In The Streets!" The training for Satoshi's rematch against Hyouta has begun! As Satoshi tries to figure out a strategy to use against Hyouta's pokemon, Hikari goes to the nearby Pokemon Center to train for her next Contest. While there, she sees a television broadcast announcing a Contest in Sono'o Town, giving the young Coordinator a goal to work toward. Meanwhile, the scientists back at the Kurogane City Museum discover that their fossil regeneration machine has been stolen by Musashi-tachi! The trio plans to use the machine to revive ancient pokemon but are stopped when a newly resurrected Ptera emerges from the machine and starts to wreak havoc! As the Rocket-Dan chase after the flying pokemon, Ptera blasts a hole in the museum wall, freeing an Armaldo and Kabutops! The three fossil pokemon eventually find their way to the mine where Satoshi is training, so a battle breaks out. Armaldo and Kabutops are eventually captured by the museum workers, leaving only Ptera behind. Satoshi is joined by Hyouta in a battle against the pterodactyl pokemon, but even their combined efforts aren't able to quell the beast's anger. Suddenly, Hikari appears and has her pokemon use their Contest moves to weaken Ptera enough for it to be captured! Now that the revived pokemon have all been retrieved, our heroes turn their focus toward the Rocket-Dan and the stolen regeneration machine. As the trio tries to escape, Hyouta's Zugaidos evolves into Rampard and sends the Rocket-Dan away with a Zen Headbutt. After seeing Rampard's power, Satoshi decides that he -has- to battle against Hyouta's new teammate! A date is set for Satoshi's rematch...can he win against Hyouta's newly-evolved pokemon? To be continued! Well, the little B stories with the Rocket-Dan in the last two episodes finally comes together to become the focus of this episode. Was all the build up worth the wait? Eh...not really. Ptera is the most whored out of all the prehistoric pokemon, so it's kind of a bummer to see it get so much screentime again. Why couldn't the rampaging pokemon be one of the neglected pokemon, like Yuradle or Anopth? OK, so maybe an Anopth "rampage" wouldn't be all that exciting (or feasible). But still. However, this episode wasn't without its good points. We get to see Hikari prepare for her next Contest while Satoshi gets some good training in with Takeshi, of all people. I mean, the fact that Usokki is used not only because it's a rock-type but also because it has the same characteristic as Iwaku is just amazing to me because it's not something I expected to see. I also like how almost everybody got to participate during the big fight at the end of the episode...I mean, even Kenzou and unnamed lab assistant got to get in on the action by throwing the Monster Balls that captured the prehistoric pokemon! After the high experienced by last episode's eleven pieces of music, we go down to a lousy seven pieces in this episode. While it's certainly better than the usual five, it's still a disappointingly low amount. PUSA has the rights to all the music and the fans constantly praise them whenever they do keep the music in, so why won't PUSA just leave the soundtrack alone? It's a win-win situation. I'm also bugged by the way Roark keeps mispronouncing the word pokémon. Listen to the way your fellow actors pronounce the word, dude. L'écran TO BE CONTINUED est trois secondes plus long dans la version anglaise qu'il est dans la version japonaise.